Why designate a California Register Historic District if the City and a developer can ignore the designation and propose to virtually eliminate it? The Spectrum Group, an Irvine-based developer, is proposing to build a 21-story hotel, a 9-story parking structure, two 7-story apartment complexes, and 20,000 square feet of office space on a 4.4 acre site that requires 8 of the historic buildings be demolished in the Flower Drive Historic District. The developer could actually achieve most of what they desire by simply rethinking the site plan and incorporating historic Flower Drive. 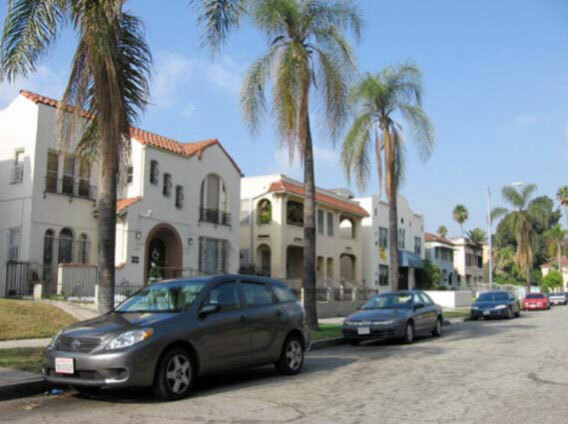 A decade ago, West Adams Heritage Association nominated the Flower Drive District (which was surveyed by the Community Redevelopment Agency as part of its ongoing work) to the statewide California Register, and the State’s Historic Commission agreed thus designating the District. The demolition of these historic resources must be stopped. A dangerous precedent is set if the City allows demolishing a major part of one historic district. What would stop it from next proposing demolition in the district you live? Many WAHA members attended the Public Scoping meeting on August 10, to raise the many issues connected to this project. The developer is asking for many entitlements to build on land that would generally permit six stories. The published project description did not even mention that the project involves demolition of eight historic buildings. The Community Plan recognizes the need to preserve and rehabilitate historic resources, but this developer has turned a blind eye to this Community Plan objective. Their answer: well there are still ten buildings left in the District; why should the removal of eight matter? Request a copy of the Draft EIR and ask to be copied on future updates so you can comment on this proposal. Go to www.planning.lacity.org. Click on Environmental Review, then go to Notice of Preparation & Public Scoping Meetings.